It has to be the most common annoyance experienced by users of technology everywhere. As soon as you want to partake in the pleasures and treasures of modern comforts, a password is required. For every frigging thing. 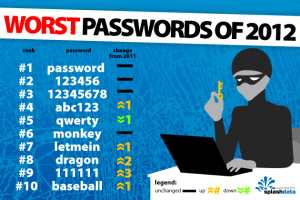 Where did they get my list of passwords from? A password is required if you want to buy stuff, read stuff, access stuff, post stuff, play stuff, write stuff, approve stuff, release stuff. A password is even required if you just want to retrieve your own goddamn stuff. You end up with a thousand different places where you need to type in those eight crucial characters. The problem is an obvious one: What normal human being has the ability to remember all the different passwords that is required for daily functioning? This entry was posted in Uncategorized by Karen Lynne Klink. Bookmark the permalink.